One of the churches in my neighborhood holds a yearly rummage sale. The word rummage is pretty appropriate in this case. I go every year because I would like to support the church's mission but they seem to recycle the same things each year with just a few additional pieces. Last year The Reader went with me and we did find two things Each of us found what may be the best FIVE DOLLARS we spent in 2011. She found the twin bed set we used to build the daybed for her office remodel. I found an oak tabletop that I turned into my dining room table. I didn't really need a dining room table. 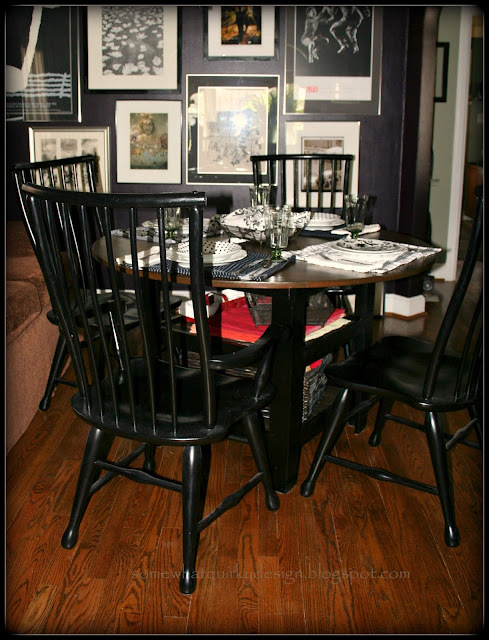 I had been wanting to replace mine with a farmhouse style table made from wood from The Reader's family barn. However I still didn't (don't) have that wood and the investment here was fairly small so I thought what the heck. I only had the guts, supplies, and equipment to do this because of my dear dream man. You remember him - the one that helped me repair/rebuild my craft cabinet. 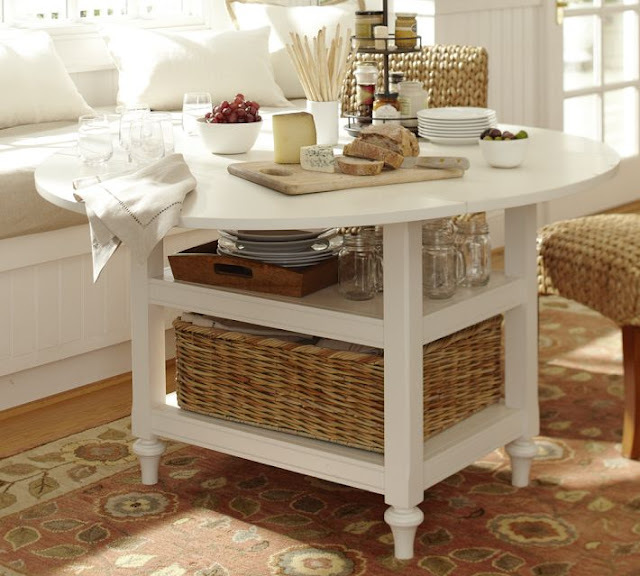 I took him this picture of the Pottery Barn Shayne Table - at the time the price was $699. Now you can buy it for $200 off. I thought the storage under the table would be pretty useful for all those things that don't really "fit" in my other storage options. He thought it was doable and that we could do it with scraps from his workshop. I'm no dummy - I know that SCRAP = FREE. The word FREE translates into "what the heck, even if I don't use it but a year or two I've lost nothing but time!" 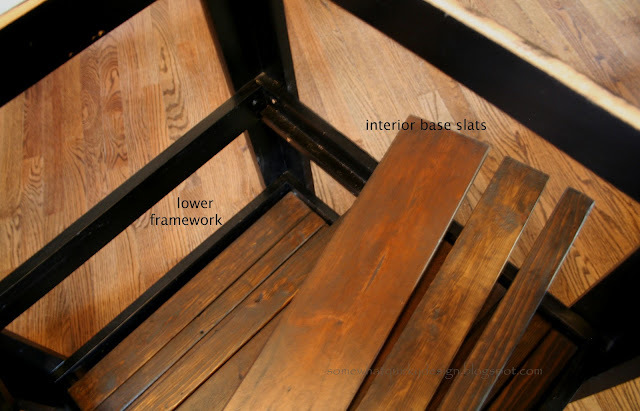 I don't have the proper pictures to do a tutorial, however I'm going to do a breakdown of the constructed table that I think will give you the ammunition you need to recreate this should you desire to. You could build this any size for any size or shape table top. Determine what final size you want. Cut 4 1x4 for top framework of table base. Measurement on these is determined by the size you want your table base to be. This table is square so I had 2 boards of the same length and 2 board that were that length minus the thickness of the other boards. Attach (screw) the shorter frame pieces to the inside of the longer frame pieces. This is your top framework. 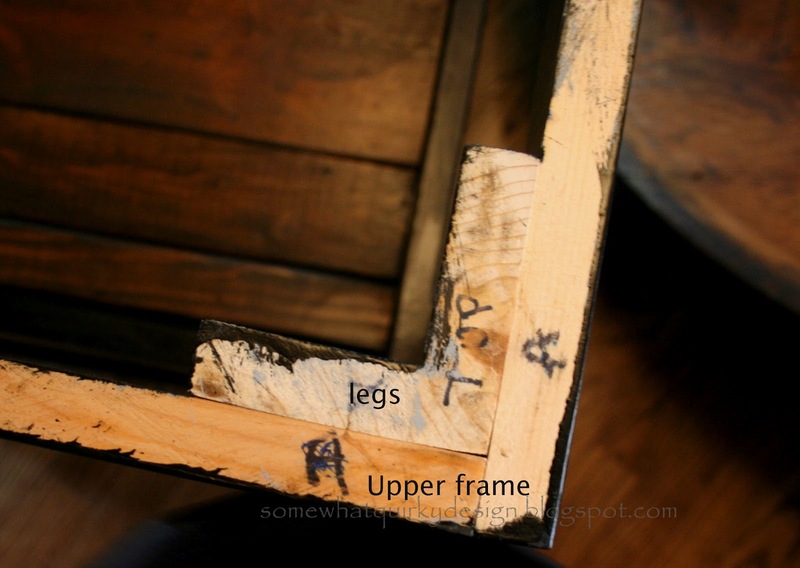 Attach legs INSIDE the top framework. Measure distance between inside of legs - this is the size for your middle and lower shelf framework. Cut 2 1x4 to this measurement. Cut 2 more the same size MINUS the thickness of the other two boards. Attach (screw) these INSIDE the legs. The bottom shelf should be at least 6 inches from the floor to allow for your feet. It could be higher if you desire. Cut 4 1x1 strips to fit the INSIDE the middle and bottom shelves. Attach (screw) to opposite sides of the middle and bottom shelves. These strips are the base that holds the shelving slats in place. At this point your table is built. Label the inside or tops of all of the pieces. Example: Side A top, Leg D top, Shelf A, shelf B Frame C, etc, - whatever makes sense to you. Put table back together. This time you can optionally glue all pieces before you insert the screws. Fill all screw holes with wood filler and use wood filler at seams as desired ( you may want to do a better job than I did). Prime and paint and use protective finishes as desired. 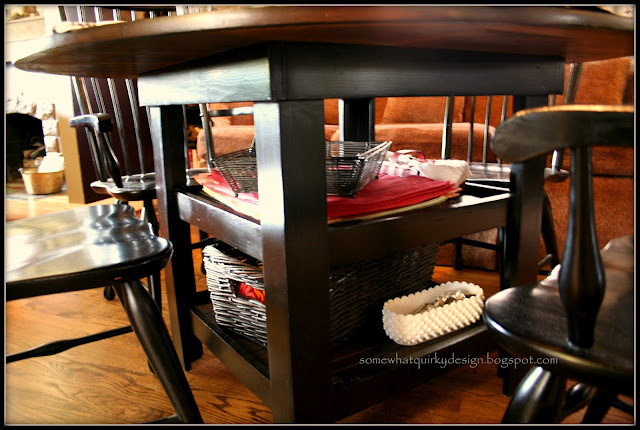 If your table is all one color paint table top and shelf slats at this time. 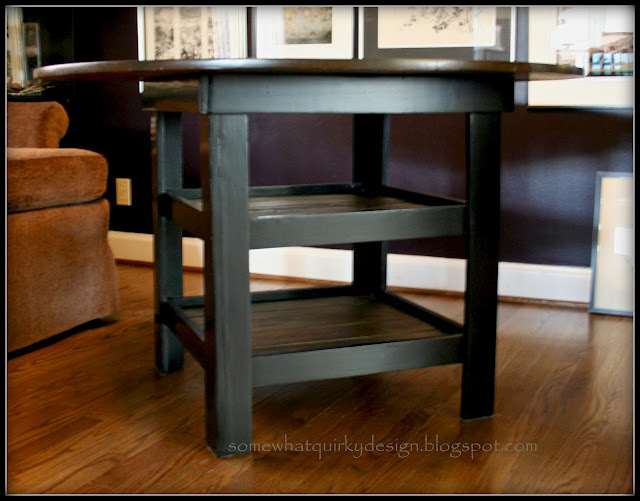 If your table is made from various types, quality and densities of wood like mine is you should prime it with oil-based primer. This will keep your final finish consistent. 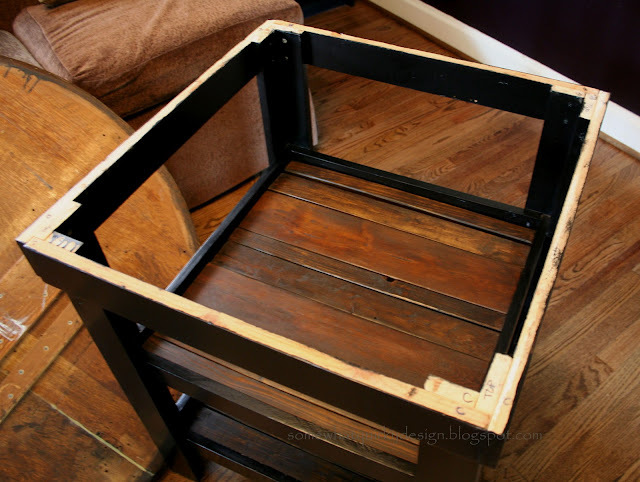 If your shelving slats are stained like mine - stain the pieces at this point. I used the rub on poly here - several coats. These pieces were really rough and low quality. The table top was warped and the pieces were splitting apart so we took it apart and used a biscuit cutter and biscuits to put it back together. If you are painting your table top you could use MDF for your tabletop to avoid having to piece together pieces of wood. 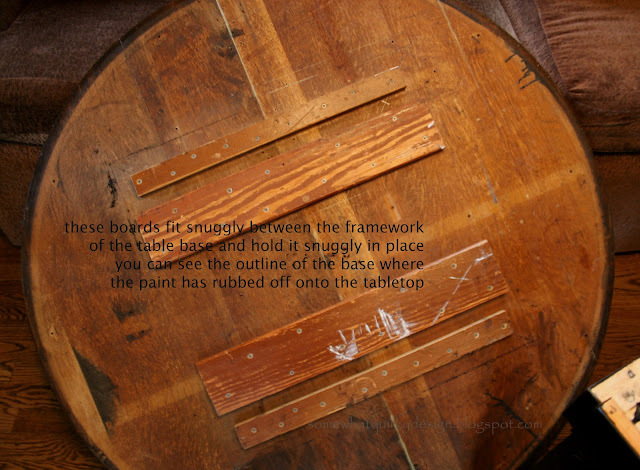 To help with the warping and strengthen the top we used random pieces of wood across the bottom of the table top. We cut these to fit firmly and squarely between the framework of the table top. 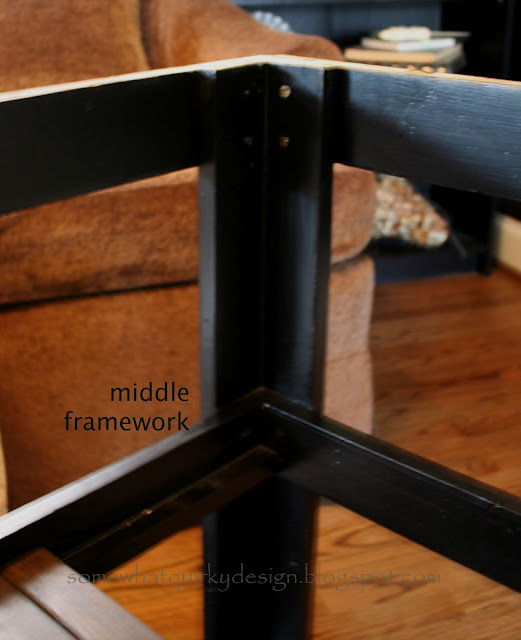 If you prefer you could use brackets and screws to attach the table top to the framework. I stained with one coat of Old Masters gel stain in Dark Walnut - my go to flavor. For the finish I used several coats of MinWax water based acrylic. I should have used oil based for a harder finish, but I don't really mind if the table gets more damage than it already had. 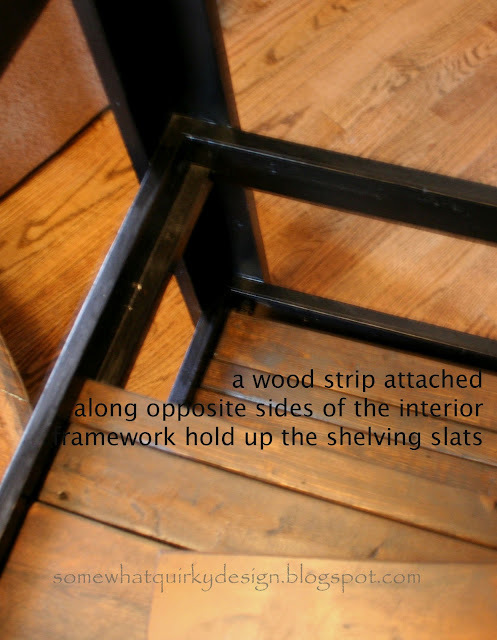 Lay out your shelving slats as desired. Put on your table top and VOILA!!!!! It is not perfect, but the reviews for the original table were not really favorable either. The table is actually too small so this is not permanent. But what in life is. 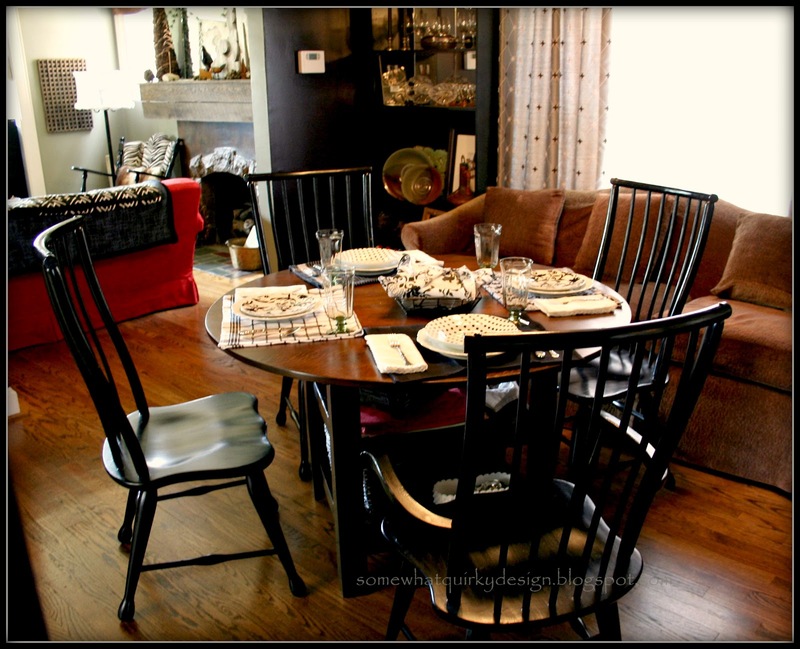 I still dream of my recycled barn wood table top - and it will happen. This one will work in the meantime. I should have sent it back, but I didn't. I just use it somewhere else. Oh well. Do you think it was worth it? Would you like to have it when I build my new table? Your table looks great and so does the color! I like the black very much. Great buy and great job building! WOW! i am totally impressed! it looks amazing! Looks great to me. Thanks for sharing at wow. It's great - I love the idea of a cute table with extra storage ! impressive job on the table! love, love,love it!! i'll be back!! Now that is a great project! Thanx for partying at my place! I like your table better. Fantastic job. The finish is beautiful. Love it! Thanks for linking up @ the Delectable Home! It's the best five bucks I've ever seen spent! How fantastic, LOVE IT!